Lavender is one of the most popular scents around, added to soaps and perfumes alike. However, this flower also has powerful medicinal properties. Its soothing scent is a favorite of millions, but lavender can offer much more than just its pleasant aroma. The flower's medicinal value has been revered for its healing powers since ancient times, and what's more, it can even be used as a seasoning. Classically beloved, lavender boasts a long history of use in almost every aspect of human culture, from medicine to religion and song. The majority of lavender's medicinal value is derived from the volatile oil found in the petals of its flowers, which, when distilled into an essential oil, are considered an important first aid remedy thanks to their antibacterial effects. Disinfecting wounds and scrapes. When applied topically, this plant shows antibacterial effects. Soothing headaches. It can be rubbed into the skin and used as a sedative agent. Inducing sleep and tranquility. Thanks to its relaxing aroma, this herb has sedative properties. Relieving digestive symptoms. Lavender can soothe indigestion. 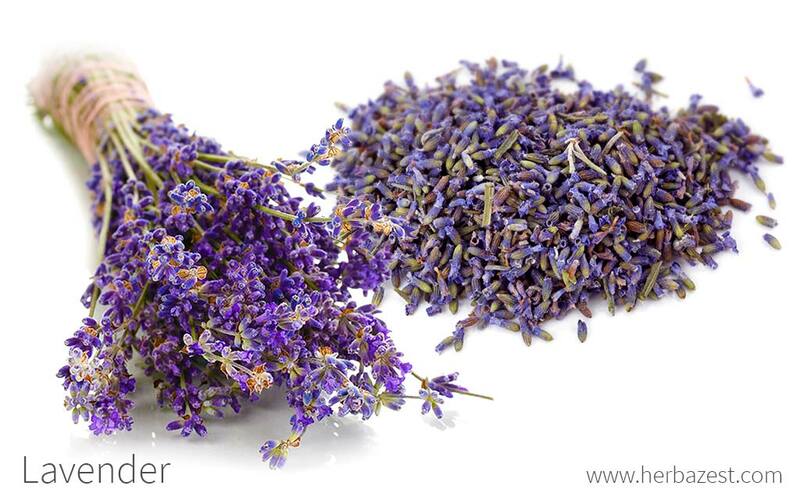 Lavender contains many organic compounds and active ingredients, most of which can be found in its volatile oil. This oil contains over 40 different components - including linalyl acetate, cineole, and nerol - that together provide antispasmodic, antiseptic, and antibacterial qualities. Its fragrance is also thought to be sedative, while tannins, courmarins, and flavonoids offer antioxidant capabilities. Mild carminative properties are also present. MOST OF THE ACTIVE INGREDIENTS IN LAVENDER CAN BE FOUND IN ITS VOLATILE OIL. Antibacterial properties are also present in calendula, whereas passion flower and lemon balm can provide similar sedative benefits. Potential side effects of the oral use of lavender include headaches, constipation, and changes in appetite. Skin irritation and allergic reaction have also been reported. Topical application and inhalation of lavender may also cause chills, headache, and vomiting. Lavender should not be used by women who are pregnant or breastfeeding or children, as lavender oil may affect hormonal balance in male babies and young boys. Lavender essential oil should not be taken orally. The oil can cause skin irritation if not properly diluted before application. Lavender mixed with painkillers like morphine or sedative medications may have an excessive effect on the central nervous system. Lavender flowers are the part of the plant used therapeutically thanks of their concentration of volatile oils. The plant has also culinary uses (mainly in its native Mediterranean region); lavender leaves, petals, and flower tips are all edible straight from the plant, and they can be added in this way to soups and salads in small quantities. Lavender is also used in beverages, baked goods, and even entrees, but the best way to reap its therapeutic benefits is using it fresh or dried in herbal preparations. Infusion. The fresh or dried upper parts of lavender are often mixed with other herbs and prepared into a warm infusion to promote relaxation. Tincture. Few drops of this alcohol-based preparation into a glass of water can soothe the nerves and help with tension headaches. Essential oil. Lavender essential oil can be diffused for a relaxing effect. It can also be diluted with a carrier oil and rubbed on the temples to relieve headaches. Lavender essential oil should never be ingested. Capsules. For a consistent dosage of the plant's active compounds the dried components of the plant can be taken in capsules. Full-sized lavender plants are available during spring and summer in many garden stores and nurseries in temperate climates. Dried flowers are also widely available in health food stores, and teas that feature the plant are popular enough to be carried by most grocery stores and supermarkets. Lavender honey is also generally available in similar locations. Herbal supplements that use lavender exist for internal and external use: essential oils and massage oils are strictly for the former, while premade tinctures and capsules are better for the latter. These can be found in specialized health stores and through several online retailers. Lavender is a hardy shrub that likes temperate climate and is very easy to take care of. Its pretty flowers have also a soothing, aromatic scent, which is why they are often used in herbal essences and potpourris. Lavender seeds are best sown in the spring well after the last frost of the season to allow for one to three months of germination at temperatures reaching 59°F (15°C). Lavender plants prefer light, dry, poor to moderately fertile soil, with a slight alkalinity and full sun exposure. Lavender should be placed in a sunny spot, in cultivar hedges with a spacing of one to three feet (30 - 100 cm) between each plant. While lavender is drought and wind tolerant, plants should generally be replaced every 10 years due to wear and tear. Pruning the flower stalks in spring months will encourage an increase in size. Detailed information about growing lavender can be found in the herb garden section. Lavender shrubs stand approximately three feet (1 m) tall and can grow almost as wide. They are comprised of many spikes of opposite foliage that end in violet-blue flowers. Fresh or dried, its blooms are the most coveted part of the plant, harvested for their high concentration of volatile oil and other nutrients. Lavender belongs to Lamiaceae, or the mint family, and it is thus linked to over 7,200 species of primarily aromatic plants, including basil, rosemary, sage, thyme, and oregano. Due to its incredible popularity as an aromatic herb, there are several different cultivars of lavender, but there are only two true subspecies: L. angustifolia angustifolia, coming from the northeastern part of the Iberian Peninsula near the Pyrenees, and L. angustifolia pyrenaica, which is native to southeast France and some parts of Italy. Cultivars are mostly chosen for their frost tolerance and the color of their flowers; 'Blue Cushion', 'Munstead', and 'Hidcote' are among the most requested. Hailing from the rocky, temperate coasts of the western Mediterranean, lavender was domesticated over 2,500 years ago, where it spread first from Egypt northward to Greece and Rome. Early Christians infused the flower with great religious meaning, and it remained a symbol of holy love for millennia. In Medieval times, the herb was commonly used to scent clothing to the extent where washerwomen became known as "lavenders." It was also the preferred scent of kings for centuries, reaching England in the 1600s and becoming an integral part of British and colonial culture soon afterwards. In recent years, lavender production has become a multimillion-dollar industry, important for the flower itself but also for its valuable essential oil. France leads the market today in full-sized plant supplies, but Bulgaria contributes an annual 220 tons of high-quality oil yield. The country's lavender oil industry is followed by France, England, and Russia. True lavender is largely cultivated in Europe alone, though other similar species are found in North America, Asia, and Australia. Gardening. Its pretty flowers and easy maintenance make of lavender a great ornamental plant. Perfume. Since classical times, lavender has been one of the most popular perfumes in the Western world, and it continues to hold sway today in several beauty industries. Aromatherapy. Lavender fragrance is used in incense sticks and aromatic oils for relaxation. Cleaning. It has also found use as a cleaning agent.